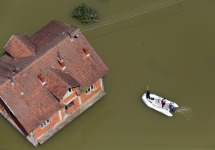 Flood and standing water make disease more likely occur. Floodwaters will likely contain sewage, toxic chemicals, blood-borne pathogens, and other potentially infectious materials (OPIM), and hidden sharp objects such as metal or glass. Lurking below these waters might also be snakes and animals that can bite, causing significant health concerns. Thus it’s critical to protect workers from becoming compromised due to these health hazards and to ensure the use of proper PPE, which may include hip waders, rubber boots with steel toes and shank, proper gloves and eye protection, as well as a hard hat. Air pollution after the storm is also a significant health hazard for FRCs. As contaminated waters begin to recede and dry out, mud and silt begins to settle on roads and the interiors and exteriors of buildings. After this mud and silt dries, vehicles and workers entering affected areas stir up this contaminated residue, making it airborne and respirable, which can cause lingering respiratory symptoms—including cough, runny nose, lung infections, and sinus problems. In these situations, PPE that protects from ingestion, inhalation, and dermal contact should be considered. This includes eye protection, appropriate respirators, and may even require disposable coveralls with hood and booties.